You'll be £12.00 closer to your next £10.00 credit when you purchase Flight Craft 7: V-Bombers - Valiant, Vulcan & Victor. What's this? Order within the next 8 hours, 25 minutes to get your order processed the next working day! There are some great images, in this book, of these famous aitcraft that can be used to aid and inspire all modellers. I particularly like the pictures of the Victor as a fuel tanker, refuelling a Lightning which will make for an easy but impressive diorama... this book is an informative overview of the V-Bomber Force aircraft that will benefit all aircraft modellers research of these ground breaking aircraft of the Cold War. Excellent small study of three large strategic bombers of the RAF that will appeal to designers! Dave Windle and Martin Bowman do a great job bringing these three bombers to life with the lineage as well as first hand accounts with the aircraft themselves. Overall, this will be a very useful resource when I finally get my hands on one of the three aircraft. Pen and Sword is cruising in the right direction here and it’s always nice to see books aimed towards building models. This book can certainly be recommended to modellers and aircraft enthusiasts as indeed is its primary aim. The book from the series Flight Craft shows many images and colored side elevations of three V-Bombers and also points to the model kit of different brands. Thirty-four gorgeous colour profiles - terrific project inspiration - by co-author Dave Windle follow. Coverage concludes with a superb section on Vulcan, Valiant and Victor plastic scale models. The build-ups are excellent!... Robustly recommended. It's a pleasing book and good value... There is much for V-Force fans and the colour profiles are inspiring. Number 7 in their Flightcraft series of soft-cover books from Pen and Sword, the authors tackle a famous trio of British post-war bombers, the V-Bombers. The Valiant, the Victor and the Vulcan were all designed to deliver nuclear weapons onto an enemy target. 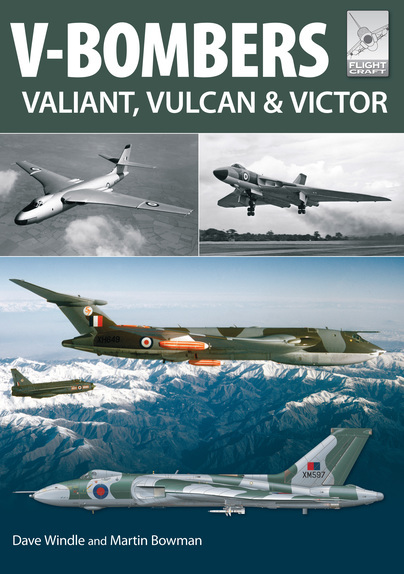 The first 27 pages are filled with the development and service history of all three aircraft types, with the Valiant being withdrawn in 1965 due to fatigue problems, the Victor moving to a new role of tanker for in-flight refueling and a change to conventional bomb loads and being fitted with an in-flight refuelling capability for the Vulcan. The story includes contributions from aircrew remembering what it was like to serve on the aircraft. The airframes were changed as the operational requirements changed, with the Valiant retiring early, then the Victor tankers providing invaluable support for the Vulcan raids on Port Stanley during the Falklands war, as well as playing an active role as tanker during the Gulf War. The Vulcan gained fame for appearing in the James Bond Film 'Thunderball' in particular, then for the long range raids on the Falklands (where a Cessna 172 parked beside the runway and belonging to my uncle was on the receiving end of one of the bombs!). At home in the UK it has been a star attraction at so many airshows over the years, with that distinctive roar as it goes into a climb out of the airfield. Well illustrated throughout this is an interesting read covering the service lives of each of the V-bombers. The history is then followed by 18 pages of excellent colour profiles of all three types, and a useful illustration of the changes in look them all, from the anti-flash white overall when they came into service, and on into the assorted camouflage schemes they wore as their operational roles changed. These are followed by lists of production blocks and serials, along with the units which operated each type over the years. This leads into the final 18 pages devoted to examining what kits have been or are available of all three over the years. From injection moulded kits in 1/144 as well as vac-form kits. Old kits by Lindberg and Frog though centre stage among them are the 1/72 kits for each one, the Revell (ex-Matchbox) Victor and the Valiant and the Vulcan both by Airfix. There is even mention of the limited edition Aeroclub vac-form for the Vulcan in 1/48. One of those books that should appeal not only to the aircraft historian but especially of course to modellers and one of the Flightcraft series that I think is bound to be popular.